Preheat oven to 325°. Spray a baking dish with nonstick cooking spray. Put fish in a single layer in baking dish. Sprinkle sparingly with cayenne pepper. Prepare chicken bouillon mix with water. Add chicken bouillon mixture and wine to baking dish. Bake for 15 minutes, just until fish is opaque in the thickest part. Remove from the oven and pour liquid into a small saucepan. Cover fish and keep warm while making the sauce. Boil liquid over moderately high heat, until only about ⅓ remains. 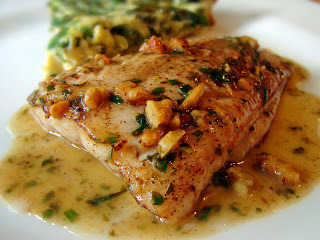 Stir in walnuts and parsley; pour over fish. Serve.